Replica of the H.L. 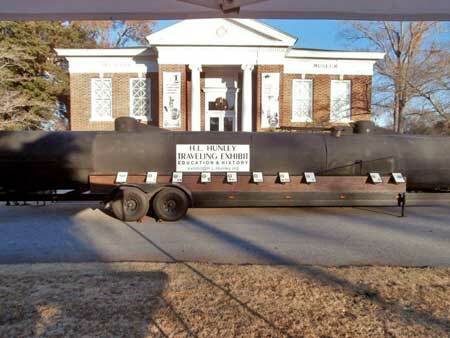 Hunley, the first submarine to sink another vessel, will be in Edgefield, September 26 2014. Mark your calendar. 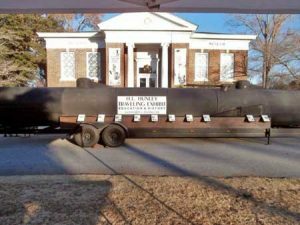 For the first time, the H. L. Hunley Exhibit is coming to Edgefield County. On Friday, September 26th, the Hunley will be in Edgefield in the Piedmont Technical College parking lot. The exhibit will be open from 9:00 a. m. to 5:00 p. m. There will also be Living History demonstrations by local re-enactors. It is free to attend and open to the general public. One of the most amazing events of American History is often overlooked and forgotten, but for seven young men and their commanding officer history was made in a night of glory and sacrifice. For the first time in history a submarine was used as a military means to attack and sink a hostile vessel from beneath the surface of the ocean. During the War Between the States, Horace Lawson Hunley converted a steam boiler into a submarine. It was first conceived and constructed in Mobile, Alabama, but was moved by rail to Charleston, South Carolina to be an effective new weapon that could be used to break the Union blockade. This Confederate submarine could be propelled at four knots by a hand-driven screw. Tragically, the submarine sank twice during testing in Charleston harbor and cost the lives of two crews, including Hunley himself. After the submarine was raised the second time, it was renamed the CSS Hunley. In 1864, the Hunley, armed with a 90-pound charge of powder on a long spike, sank the Federal steam sloop, USS Housatonic, at the entrance to Charleston Harbor. After her successful attack on the Housatonic, the Hunley disappeared and her fate remained unknown for 131 years. Even though she was lost, the Hunley proved that the submarine could be a valuable weapon in time of war. In 1995, the wreck of the Hunley was located four miles off Sullivans Island, South Carolina. It was recovered in 2000 and is carefully being examined and preserved in Charleston. The Hunley traveling exhibit, built by John Dangerfield, is an exact life-size iron replica of the original and experiencing it in person will give the visitor a hands-on feel for the conditions experienced by the crew. The length of the replica is approximately 65 feet and its width is about 4 feet. The Hunley exhibit is accompanied by the H. L. Hunley Camp #43, Sons of the Confederate Veterans living history encampment. It is in memory of Mr. H. L. Hunley and all those that served their country to the fullest extent that this exhibit was created. The H. L. Hunley Exhibit is sponsored in Edgefield by the Old Edgefield District Genealogical Society.